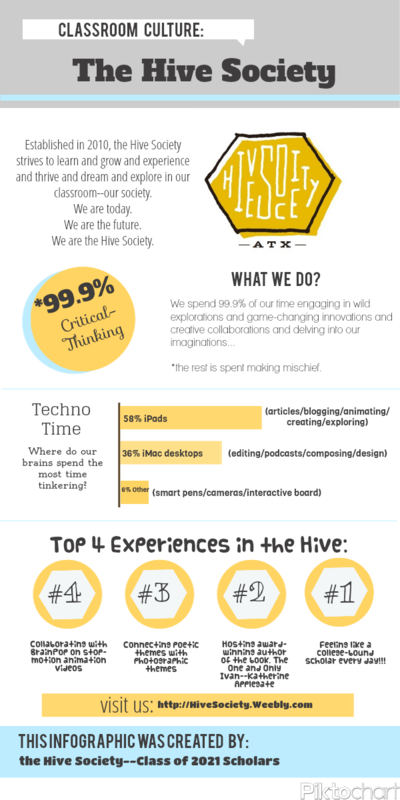 When people walk into my classroom -- renamed The Hive Society -- they aren't quite sure what they've entered. There are no textbooks, there is not one single desk, there are no stock motivational posters with children in neon eighties garb, no signs telling students to turn off their voices. Instead, desks have been replaced by conference tables, vintage stools, low-to-the-ground tables, and area rugs. Authentic student work and thought-provoking prompts leave no room for cliché posters. Textbooks have been stacked away in closets while tablets and desktop computers are easily accessible. And students are greeted each day with the challenge to activate their voices. The classroom is merely a vessel for innovation to bloom. A teleport from fundamentals to deeper levels of thought. My inspiration came from glossy photos of the newest startups with their converted lofts and warehouses -- giant spaces organically separated with couches and wooden tables for intimate groups of thinkers to spread out, collaborate, and develop. My first encounter with creative spaces was a magazine article showcasing the offices of Google. The design was fresh, brave, and inspiring. I began to notice other companies using similar frameworks -- each different according to their purpose. These startups not only introduce products and concepts that harness novel thinking, but their work environment itself embraces invention. Yet as our society grows to rely on radical thinking for our future success, the classroom has continued to stay the same. Children thrive just as adults do: creative spaces spark creative thinking. The age-old concept of the classroom is significantly behind what our modern world expects college graduates to be capable of. Everything from communication and partnerships to brainstorming and developing is stifled within the confines of separate desks, cheesy posters, and flat textbooks. It's time for the world of education to not only redefine the curriculum placed in the hands of America's teachers, but also to redefine the classrooms in which we breed young scholars. Restructuring the classroom aesthetic or culture isn't, by any means, the fix-all. There are layers of interventions and adjustments needed when addressing the failures of the American school system, all of which are valid and just. But everything from curriculum to instruction could very well fall flat without the foundation of a comfortable space that sanctions critical thinking and collaboration. The flourish of innovation needs room to breathe freely. And the classroom desperately needs to become that definitive space. About Emily Smith: Emily E. Smith was born with the heart of a teacher; even as a kid, she was always ready to help and assist her classmates. As a Language Arts teacher at Cunningham Elementary School in Austin, Texas, Smith is part teacher and part caretaker to her students, creating a literature-rich environment in which her students thrive. Smith has found her niche teaching fifth grade through her self-created Hive Society. 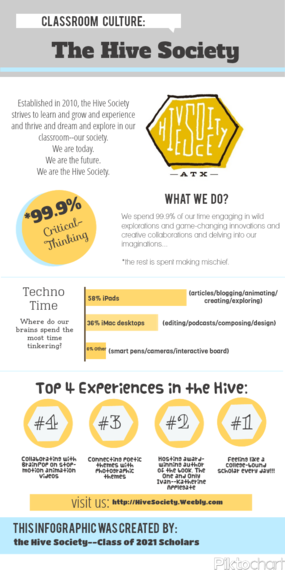 The Hive Society integrates technology within the classroom setting and incorporates all different sources of interactive material.